As per Drik Panchang the date of Vijayadashami in 2013 is on October 13th. The team of Drik Panchang has received many queries on the date of Vijayadashami. Many sources have published Vijayadashami on 14th October. We follow festivals rules mentioned in religious texts, including Puranas to decide the day of the festival. We don’t change our calculations to match the modern dates of the festivals and stick to what have been dictated in various religious texts. 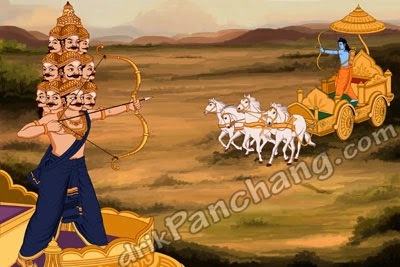 This year there is no dispute among various religious texts to decide the day of Vijayadashami. On October 13th, Dashami Tithi starts at 13:17 and prevails during whole Aparahana duration (i.e. afternoon). It is Aparahana time of the day when most rituals on Vijayadashami are followed. Further most religious texts emphasize on the importance of Shravana Nakshatra on the day of Vijayadashami. On October 13th, Shravana Nakshatra prevails from sunrise to throughout the day. On October 14th Dashami Tithi is getting over at 11:15 only and this day doesn’t have significant touch of Shravana Nakshatra. Devotees who would observe Vijayadashami rituals on October 13th should not have any doubts on the significance of the day compare to October 14th. The day of October 14th has neither Tithi during Aparahana time nor the Sparsh of Shravana Nakshatra. The city based timings for Vijay Muhurat and Aparahana Puja Time can be checked on the following page Vijayadashami Puja Time.